MALE DOCTOR (talking to a patient who’s wrapped head-to-toes in bandages): Good news. I fixed your hangnail! MALE DOCTOR (talking to a patient who's wrapped head-to-toes in bandages): Good news. I fixed your hangnail! 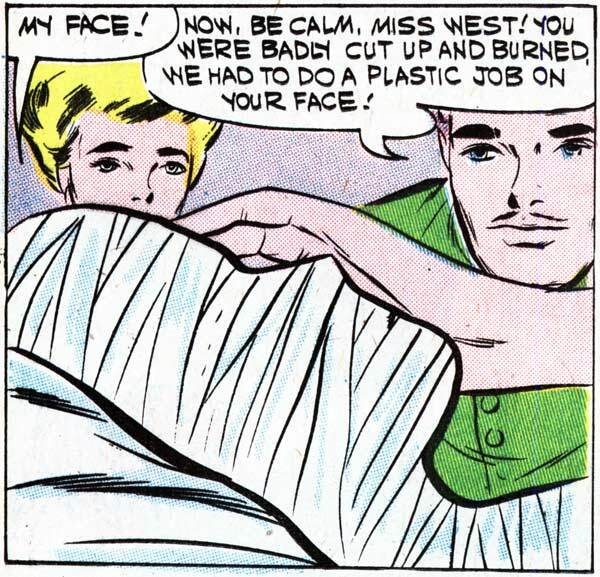 What Miss West doesn’t know is that we replaced her normally beautiful face with Folger’s Instant Coffee. Let’s see if she can taste the difference. The irony being, she’s a gargoyle model by trade. And they’ve made her beautiful. Shades of that classic Twilight Zone episode “The Eye of the Beholder”. But after reading the surgeon’s caption on the original art, all I could think of was that nowadays, they’d only do a “plastic job” on your credit cards.